Congratulations to Cyler Conrad on his new article: Kangaroos and the California Gold Rush. California History, 94(3): 62-65. DOI: 10.1525/ch.2017.94.3.62 To read the full article, clickhere. Men, women and their families arrived in large numbers to northern California with the dream of striking it rich during the mid-19th century. What most people don’t know about the California Gold Rush is that exotic animals became as much a part of the experience as the exotic medals. Conrad’s findings, recently published in an article in the journal California History, suggest that some of the exotic animals imported for food include Galápagos tortoises, sea turtles, turkeys and Atlantic cod. Other non-native animals imported during the Gold Rush-era served as support for hygiene and entertainment needs. Conrad in the anthropology lab researching Gold Rush-era tortoises. Of all the exotic animals that traversed the waters of the Pacific to reach their destination, it was the Australian kangaroo that not only traveled the farthest, but also played one of the most versatile roles. Initially, kangaroo rugs and skins arrived by boat, sold with other leather and calf-skins as a textile to meet the high-demand for clothing for the exploding population. According to Conrad, it was in September 1852 that a living kangaroo first set foot in the Golden State. Just a few years later, another ship arrived with a load of several cattle, emus, a horse, a kangaroo and two kangaroo dogs, also known as dingos. According to Conrad, local accounts fail to document what became of these exotic animals, but they were likely put on display for profit, or perhaps even eaten by hungry Argonauts. While many exotic animals were imported by the thousands for food, it is the kangaroo that escaped the fate of a meal and was instead used for amusement. Conrad’s dissertation research focuses on understanding human-animal interactions in the past, something he says UNM is particularly well suited for. 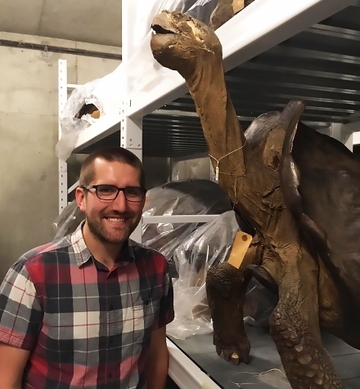 Whether using the library archives or animal comparative specimens in his advisors, Emily Jones’, Zooarchaeological Laboratory, Conrad indicates that UNM faculty and students continue to be at the forefront of exciting new research into the historical dynamics of western North America.